Goodmorning to you all!! It's finally Friday and I think we are all looking forward to Christmas shopping and festivities to commence this weekend. In Mexico, we celebrate the run-up to Christmas by organizing "posadas" at friends and family's homes. I'm not so big on the whole "posada" tradition but I do have friends who attend at least 15 of these get-togethers, sometimes making it to 2-3 per evening. Crazy! 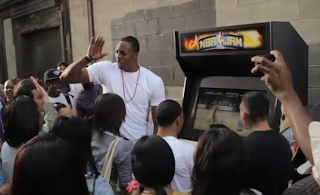 I want to end the week with a post that takes us back to my childhood as an avid Super Nintendo gamer, this time around its for Xbox and it features Dwight Howard breaking out the "BoomShakalaka!!" for NBA Jam on the streets of New York. Check it out below! Great guerilla campaign that connects a key player in the game with a very engaged crowd. I'm glad to see this trend spreading into other industries and as always a high energy and interest from the crowds.